Willis Dean Bowman, age 83 of McBain, passed away at his home surrounded by his family on March 16, 2019.Willis was born on Feb. 12, 1936 in Monclova, Ohio, to Henry H. & Grace Mae (Nicholes) Bowman. He married Jane A. Wheeler on May 4, 1956 at the Marion United Methodist Church. He is a member of the Marion Baptist Church where he had served as a deacon. Willis had worked as a machinist for Ben Tec and retired out of the Reed City Facility. 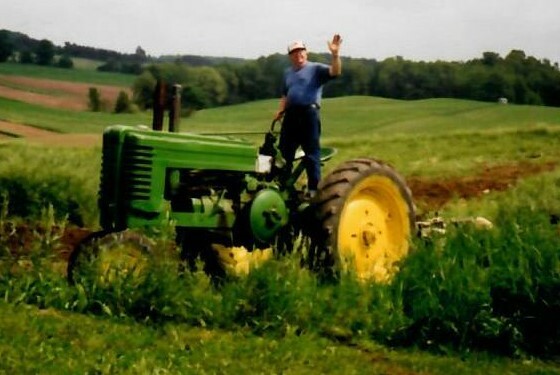 He had also farmed and loved driving his 1946 John Deere A. He liked to play solitaire, and do different puzzles and crossword games. He enjoyed feeding and watching the birds and liked playing his harmonica. The Bowman family moved from California to McBain in 1967. He is survived by his wife, Jane A. Bowman of McBain, his children, Pam (Jim) Raspotnik of Manistee, Kevin (Jeanette) Bowman of Weidman, Willis Bowman II of McBain, Melissa (Jon) Gassert of Marion, and Michael Bowman of McBain. He has 11 grandchildren and 15 great grandchildren along with his siblings, Rita Crittenden of Lake City and Martha (Lyle) Armentrout of Clare. Also, surviving are two in-laws, Ruth (Ken) Cruson of Marion and John (Peggy) Wheeler of Marion. He was preceded in death by his parents and a son, Jeff Bowman, Siblings, Frank Bowman, Bob (Mabel) Bowman, Keith (Betty) Bowman, Lawrence Bowman, Mamie Brown, Hazel Bowman, Donna (Ross) Sneary, and Lila Hendershot, and in-laws, Joe (Lamar) Labon.